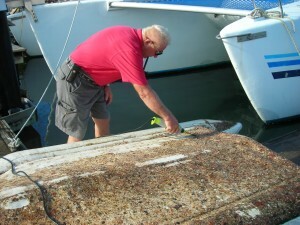 Cleaning barnacles and growth from your hull is a nasty job. Well, that job just got about 100 times easier. Enter THE WAVEBLADE. This little gem of modern technology should be in every boaters tool box. The best way to see how it works is by watching the videos. Take a look, then come back to read more about this miracle machine. And, as you will see, it works underwater! I think every cleaning service will soon have one or six. The modern Waveblade hull and boat cleaning power tool gets better results more easily, quickly, cost-effectively, safely, and conveniently than any other known method on the market. It is the first hard fouling removal power tool that can be submersed under water up to depths of 15 feet. Its patented pin in wave technology generates a high-speed harmonic vibration that removes all types of growth by vibrating them off any boat surface or marine structure without damaging the paint. Say goodbye to the 3000 year-old traditional method of hull cleaning using hand scrapers and elbow grease! 1. Cost Effective The Waveblade pays for itself for about the cost of one annual haul-out, then your hull cleanings are free every year thereafter when you use the Waveblade. It works underwater so that’s another good reason to say goodbye for good to haul-out fees. 2. Versatile Convenience Plug the 45ft cord into a 12 volt outlet and clean hulls anywhere: underwater at the mooring, at anchor or even while hauled out in the boatyard. 3. Good Vibes Their patented vibration agitates growth off surfaces not by friction like putty knives or scrub pads. Friction wears your paint away more quickly. No friction here! With Waveblade’s good vibes on your side make your paint last longer. 4. Deeper Cleaning Remove barnacle bases and scale quickly and thoroughly. With our accessory blades you can really get into previously safe hiding places. Waveblade will help with detailing for results you can be proud of. 5. Faster Results The proper tool for a proper job, this power tool cuts through all kinds of fouling quickly and efficiently. Get the job done fast with less effort. 6. Baby Your Baby The Waveblade is tough on growth but not the boat. The motion of the tool’s oscillation is built not to penetrate surfaces so you can use it on anything from inflatable pontoons to concrete and everything in between. 7. Less Physical Effort The vibrations do the work so you don’t have to, making a job that was until now, exhausting, much easier. That means energy to enjoy the day when the work is done. 8. Clean and Mean Get that hull and running gear clean so you spend less at the pump and slice through the water. Fouling can cause a 10% drop in speed and a 40% increase in fuel consumption. Ouch! Be clean and mean: Save Fuel! Go Fast! 9. Protect Yourself No need to beat yourself up. They have a built in a knuckle guard protects against cuts and scrapes. 10. Environmentally Safe Waveblade creates minimal pollution when compared with present hull maintenance techniques such as pressure washing, hand scraping or scrubbing. It will drastically reduce carbon emissions from craft by returning hulls to factory efficiency. 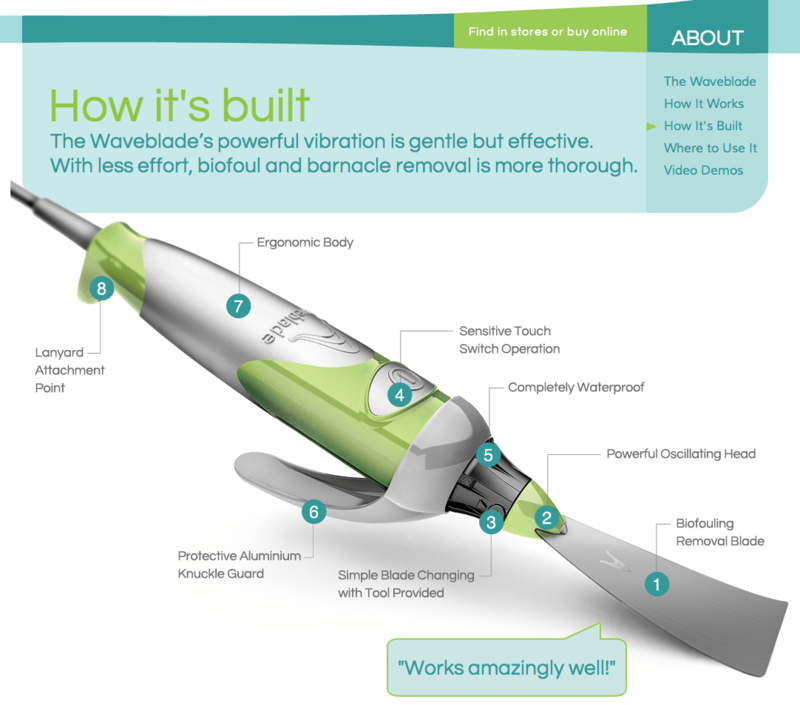 From their website they describe how it works- “The Waveblade’s patented technology delivers high frequency resonance via the oscillating head sending multi directional vibration through the blade into the unwanted marine growth.” Whew, that’s a mouth full, let’s just say it work brilliantly! This lightweight hand held completely submersible power tool is specifically designed to remove biofouling without harming underlying surfaces, not even bottom paint. * Remove barnacles and their stubborn calcification rings, tube worms, mussels, oysters, rust and slime. Safely use Waveblade on a variety of surfaces such as fiberglass, metal, wood, concrete, plastic or even inflatables. Perfect for outboards and running gear. At home on land Waveblade is just as comfortable underwater. Engineered and rigorously tested the Waveblade is certified for an operating depth of 15 ft / 4.6 m.
The Waveblade is driven from a standard 12V DC power source, and is attached to a 45 ft / 13.7 m cable giving substantial reach from the surface. So you might be asking, what surfaces can my Waveblade be used on? The Waveblade boat and hull cleaning tool goes beyond boat cleaning. It can be used on fiberglass, steel, and wooden hulls, steel structures, concrete, and many more surfaces. It can also be used on propellers, shafts, Z drives and rudders. They do recommend using the delicate surface scraper on wooden hulls and soft materials. For more information about the Waveblade go to their website: www.waveblade.com and check it out. ***Update*** We have heard back from some of our readers that the reviews we posted on this product aren’t telling the whole story. Always conduct a thorough research on your own before purchasing any product. Get Wet Sailing strives to bring you information on the best sailing products out there. Get Wet Sailing is not affiliated with Waveblade and did not receive any financial benefit from this post. It’s really hard to tell if a product is worth buying when you read an article like this which only quotes marvelous reviews provided by the manufacturer. But then you go to buy it and on the sellers reviews you find people complaining about how it falls apart when they use it. So we have an article here written by someone who has never used the product, but has decided to put great reviews to make it sound like it’s something that you can’t go wrong with. This gives me the impression that getwetsailing doesn’t have a clue what they’re talking about. Thank you for your comment and bringing this to our attention. Get Wet Sailing strives to bring you information on the best sailing products out there. We get our information from using products hands on, doing research from others who have used the product along with recommendations from our readers and other sailors. The Waveblade was recommended to us by a fellow sailor, and we have not had the opportunity to test this product personally. Get Wet Sailing is not affiliated with Waveblade and we did not receive any financial benefit from posting about their product. If you have found another product that works better for you and your sailboat we would love to hear about it. In the meantime, we will post an update to the article. As always we value your feedback and the feedback we get from all of our readers. Thanks.